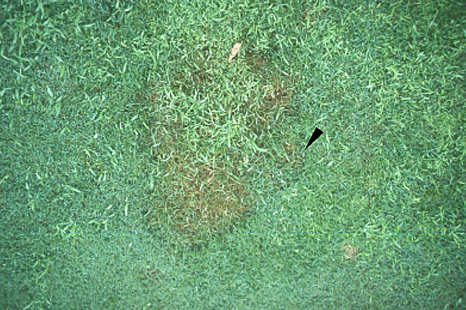 Rhizoctonia solani causes unsightly patches of blighted turfgrass (Figure 1) and is capable of infecting and killing most cultivated turfgrass species. This disease is very damaging to young immature grass seedlings. During long periods of hot, wet, and humid conditions, brown patch can develop so that a large blighted area can occur within 24–48 hours. Preventative and curative fungicide applications are made for managing the disease on highly cultivated turfgrass such as golf course greens, tees, and fairways. The disease is a common nuisance in home or commercial lawns, but in most cases it does not kill the plants. Turfgrass usually recovers from light attacks in 2–3 weeks with a change in environmental conditions, such as cooler temperatures and/or dry conditions. Figure 1. Brown patch on a creeping bentgrass putting green. Rhizoctonia species are best characterized as being facultative parasites. The fungus survives on decaying organic matter or in soil, but will use living plant tissue if available. Rhizoctonia solani is classified in the group of basidiomycetes, club and mushroom fungi. However, the brown patch fungus is known to produce no spores or mushrooms, and is often referred to as being in the group of imperfect fungi known as the mycelia sterilia, fungi with sterile mycelium. Sclerotia, compact masses of mycelia, are formed for surviving under unfavorable conditions. Symptoms of brown patch vary greatly depending on turf species, mowing height, soil, and environmental conditions. In low cut turfgrass, symptoms appear as irregular, blighted patches of a few inches to 2 feet in diameter. A field diagnostic feature is a dark purplish gray smoke-ring border on the outer edge of diseased areas (Figure 2). The diseased area may appear as a thin stand with some green leaves present within the patch. In high cut turfgrass, affected areas appear as larger irregular circular patches or areas of 2–3 feet in diameter or general thinning of areas with irregular shapes. Leaf lesions are irregular and not distinctive. Leaf tissue within the margins is often gray and grungy-looking (Figure 3A) as opposed to dollar spot that generally has a lighter tan color and expands across the entire width of the leaf blade, looking like the shape of an hourglass (Figure 3B). 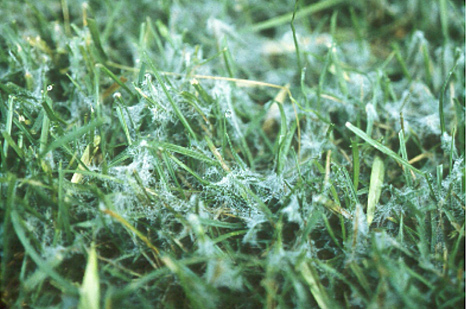 White mycelium growth in the turf canopy may be encountered during periods of high relative humidity (Figure 4), but it may be confused with mycelium of dollar spot or pythium. These hyphal characteristics are used for diagnostic purposes in the lab (Figure 5). Figure 2. Dark purplish gray smoke-ring on creeping bentgrass affected by brown patch. Figure 3. Grungy-looking lesions of brown patch on tall fescue (A) and hourglass-looking lesions of dollar spot on Kentucky bluegrass (B) (photo courtesy of David Gardner). Figure 4. White mycelia of brown patch on tall fescue. Figure 5. Key microscopic diagnostic characteristics of Rhizoctonia solani: a septum (A) and a 90-degree angle branching with a narrow neck (B) of the hyphae. Genetic Host Resistance. All cool season turfgrass species are susceptible to brown patch. In general, Kentucky bluegrass is less susceptible than ryegrasses or tall fescues. Moderately resistant cultivars of perennial ryegrass, Kentucky bluegrass, and tall fescue are available. Most creeping bentgrass cultivars are susceptible to brown patch. Colonial bentgrass is very susceptible to the disease. Cultural Practices. Avoid excessive nitrogen fertilizer applications, especially in warm and wet weather. Keeping foliage dry and avoiding wet soil are the most important practices to reduce disease pressure. Irrigation should be reduced, especially late in the day during disease-activating periods. If possible, irrigate in the morning. Excessive water should be properly drained. Increase light penetration and air circulation to reduce the level of free water and humidity on turfgrass. Chemical Control. Preventive fungicide applications are made on bentgrass fairways, greens, and tees when environmental conditions are favorable for brown patch. The first application should be made when the night air temperatures do not fall below 67°F and there are wet conditions. There are many fungicides labeled for managing brown patch. Please refer to OSU Extension Bulletin L-187, Management of Turfgrass Pests, for the most current recommendations for the management of brown patch on turfgrass (turfdisease.osu.edu/publications).